Muscular and stocky yet agile, the American Staffordshire Terrier is known to have a bigger bone structure than an American Pit Bull Terrier. This dog breed has a short muzzle and very powerful jaws. It is considered to be the 'all American dog'. 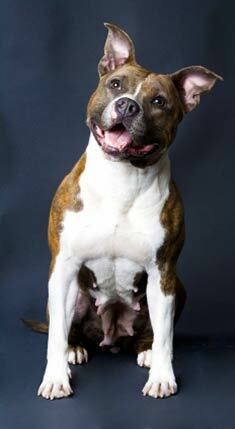 The American Staffordshire Terrier can be a combinations of white, black tan and liver. The American Staffordshire Terrier's coat is short and sleek, and should be brushed regularly. A rub with a chamois will make their coat shine. The AmStaf is an average shedder. When properly trained the American Staffordshire Terrier is an excellent companion with both children and adults, as well as an excellent guard dog. The AmStaf is loyal, courageous, willing and very eager to please its master. It will protect its master no matter what. This dog was originally bred as a fighting dog and can be aggressive towards other breeds, particularly if not properly trained. It can also be difficult to housebreak. It is not a breed for a beginner. The American Staffordshire Terrier can be expected to live up to about 10-12 years. 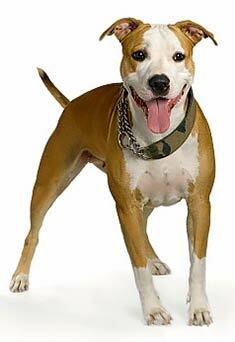 American Staffordshire Terriers can live in an apartment without a yard provided they receive plenty of exercise. When walking the AmStaf in public places it must be kept on a leash to avoid fights with other dogs. Find American Staffordshire Terrier Puppies with our Free Breeder search!